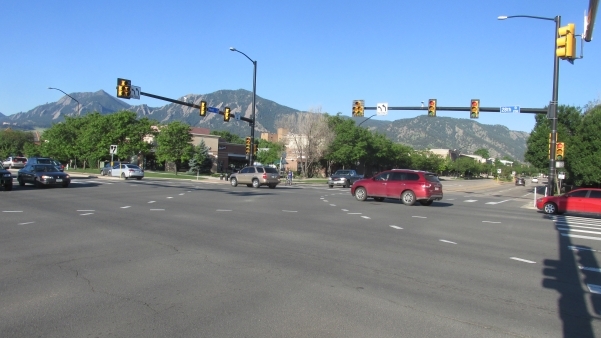 Editor’s note: Throughout the summer we will run a serialized version of PLAN-Boulder County’s A Transportation Vision for Boulder. This is part 1 of section 1. To read the entire paper, start with the Introduction. The design of transportation in a community has a profound influence over agglomeration and exchange. Larger roads, higher speeds, and abundant free parking undermine agglomeration and exchange; such facilities act as powerful dispersants. Existing and emerging town centers thrive when the pedestrian is the design imperative, and car travel is designed to be secondary. When pedestrian design is emphasized, agglomeration economies and exchange are promoted, as design is compact, low speed, and human-scaled. In other parts of the community transect, design differs. In lower density areas, road and parking infrastructure are larger, speeds are higher, and development is both more dispersed and lower in profile. One of the most important transportation problems that Boulder faces is that, like many U.S. cities, car-carrying capacity on some roads has been overbuilt over the years. Excess capacity for car travel induces many car trips that would not have occurred had this large capacity not been built. Large roads directly undermine a great many important Boulder objectives that the city strives to achieve, such as reducing total vehicle miles traveled (VMT) and trips in single-occupant vehicles (SOVs). Oversized roads become flooded with local, non-commuter car trips, and thereby quickly become congested. Expensive efforts to reduce the problems can include road widening, augmenting transit options, and construction of expensive under- or over-passes for motor vehicles, bicyclists and pedestrians. Whereas it makes sense to promote a more financially and physically healthy community by providing more dollars directed toward bicycle, pedestrian and transit improvements, the path of simultaneously overbuilding roads for cars is unsustainable and detrimental to quality of life. A more desirable, affordable and sustainable path is for Boulder to incrementally begin reducing any oversupply of car capacity (particularly in the existing and emerging town centers). Doing this is particularly important if Boulder is to achieve its worthy objective of reducing GHG emissions by 80 percent by 2050. PLAN-Boulder County believes that transportation is a leading lynchpin to high quality of life in Boulder. Despite arguments to the contrary, motorists do not pay for the costs they impose on society (such as road construction and maintenance, air and water pollution, oil wars, injuries and deaths) because gas taxes and other motor vehicle fees are inadequate to the task. According to an analysis conducted by the Pew Charitable Trusts Subsidy Scope Project (2009), road user fees paid in the United States—including fuel taxes, vehicle registration fees and tolls—make up a decreasing share of the cost of highway construction and maintenance. The research, based on Federal Highway Administration statistics, concludes that the percentage of revenue coming from road users was 51 percent in 2007, compared with 61 percent in 1997 and 71 percent in 1967. The remaining costs of automobile travel are subsidized by general fund revenues of the city or community. Other studies have also found large subsidies for autos. In 2007, Delucchi found that, in the U.S., current tax and fee payments to the government by motor-vehicle users fall short of government expenditures related to motor-vehicle use by approximately 20-70 cents per gallon of all motor fuel. Note that in this accounting, the study included only government expenditures; it did not include any external costs of motor-vehicle use. That implied subsidy of 28 cents to one dollar a gallon, which excludes social and environmental costs such as climate damage and uncompensated crash costs, equates to 7 to 25 percent of the current price of gasoline. On a dollar basis, according to Delucchi, U.S. drivers are underpaying local, state and national governments by $40 to $105 billion a year. Free parking is anything but free. As Donald Shoup points out, for example, free parking provided by retailers results in the price of goods and services inside the stores where free parking is located to be higher. The price of goods and services are higher to allow the retailer to pay for the land and maintenance costs of the free parking. If the parking were properly priced—in other words, charging a fair user fee for parking—the price of goods and services inside the stores would be lower. In addition to the direct car subsidies described above, large subsides for suburban development means that motorists also benefit from artificial cost reductions that further distort the perceived cost of their more remote, car-dependent lifestyle. For example, the market demand for dispersed, auto-dependent residential property is buoyed by the heavy income tax subsidies for owner-occupied homes, federally-funded wastewater systems, provision of police and fire services, provision of postal and waste diversion services, as well as the road and parking subsidies. When new developments are built in areas remote from water plants, wastewater plants, and schools, it creates higher incremental (or marginal) costs for adding new capacity to the services. By contrast, the marginal cost of new development near such services is lower. However, because costs are evenly distributed among all citizens by average-cost pricing, those who live in remote locations pay proportionately less. As a result, citizens living in remote, car-dependent locations enjoy an enormous price subsidy courtesy of citizens living closer to the services. If motorists living in remote suburban locations had to pay the full cost of driving, transit could require less and possibly no subsidy to operate efficiently. There would also be less demand for suburban housing if outlying growth paid more of its fair share of development impacts. In sum, American motorists (and the drivable suburban lifestyle that many of them live) are among the most heavily subsidized people on earth. Motorists and those in suburban locations pay nowhere near the costs they impose on society. Such a distorted price signal induces a great many Americans to be more interested in living in suburban locations, and they own cars and drive cars a lot more than they otherwise would. Starting to eliminate such motorist welfare would substantially reduce driving, significantly increase bicycling, walking and transit use, reduce air and water pollution, reduce sprawl, increase affordability, improve household and government financial health, improve civic pride, and create more physically healthy communities. A helpful fee to restore equity and reduce motorist subsidies is a vehicle miles traveled (VMT) fee. A VMT fee, according to Wikipedia, is an alternative to using a gas tax, both of which offer a fairly pure form of user fee, as each obligates the motorist to pay based on how much the road system is used by the motorist. Instead of using a tax on fuel consumption as a way of financing transportation infrastructure, a VMT fee charges motorists based on their road usage measured in mileage. These charges can be either a flat fee (e.g., a fixed number of cents per mile, regardless of where or when the travel occurs) or a variable fee based on considerations such as time of travel, congestion levels on a facility, type of road, type and weight of the vehicle, vehicle emission levels, and ability of the owner to pay. Or it can be a combination of flat and variable fees. The variable fee is, of course, more fair, since it more accurately measures impacts of driving. For example, variable fees are assessed based on whether the motorist drives at rush hour, how much damage the vehicle is likely to do to the air or roadway, or which route is used. A VMT fee can monitor travel by using an onboard vehicle device to capture the distance driven by a vehicle through GPS or other technology and relate that to a method of charging, which could involve payments at the gas pump, billing, or automatic deductions for a prepaid customer account. GPS units on board a vehicle can record distance, assign it to the appropriate taxing jurisdiction, and calculate the amount owed. Only the final billing information would have to be released outside the unit, to protect privacy. Other useful, fair fees include a more comprehensive, market-based, parking pricing program; priced intra-city roads; pay-at-the-pump car insurance; weight-distance fees; mileage-based insurance; mileage-based registration fees; mileage-based emission fees; and gas taxes that are based on a percentage of the price at the pump. If possible, such new taxes/fees should be revenue neutral by reducing or eliminating other fees/taxes when the new user fee is instituted. The annual cost of car ownership, operation, and maintenance is now well over $9,000 per year. One hundred years ago, transportation was about 2 percent of the overall household budget. Today, household transportation cost—at about 21 percent and rising—is now second only to housing cost for the household budget. Given this reality, one of the most effective ways to create more affordable housing in Boulder is to design new neighborhoods to reduce travel distances, creating what the Boulder Transportation Master Plan calls the 15-minute neighborhood. Reducing distances can be effectively achieved by sensitively mingling homes with neighborhood-scaled offices and retail that are small enough to not be a bother to nearby residences. Households located in such 15-minute neighborhoods are better able to reduce the number of cars that the household must own. Going from, say, three cars to two, a household will have over $9,000 more each year that it can devote to other expenses, such as the cost of buying or renting a home. There is an essential need for us to recognize that some trips are relatively high-value, and some trips are relatively low-value. A motorist driving a car on a major street at rush hour to buy a sandwich is making a trip that is much lower value than a motorist who is racing to the hospital for a medical emergency. When roads are free of tolls and other direct user fees, roads tend to be flooded with relatively low-value trips. The mistake made too often is that when a community opts to widen a road or intersection if it becomes congested, all of the trips on the road are assumed to be equally high-value. This is simply not true. Nor is it affordable. A large number of trips on free-to-use roads are trips for relatively minor tasks such as buying a cup of coffee. Or they are trips that could have occurred on different routes, at different times of day, or by bicycle, walking or transit, rather than by car. By assuming, as is almost always the case, that all car trips are essential, the community is opting to spend enormous amounts of public dollars to widen a road or intersection to enable or otherwise accommodate such low-value car trips. This sort of worst-case-scenario design is utterly unaffordable and unsustainable from a financial point of view. And helps explain why there is a huge, nearly universal shortfall of transportation revenue throughout the nation, including in Boulder. Given this, sustainability and financial health requires that Boulder avoid assuming that all trips are equally high in value when it comes to managing congestion. There are much cheaper and fairer ways to manage congestion than by spending many millions of public dollars to widen a road or intersection as a way to accommodate car trips to the coffee shop at rush hour. The good news is that a community does not need to determine which trips are high-value and which trips are low-value. Citizens are able to make that choice on their own in an efficient, properly designed transportation system. For example, a tolled road or a metered parking space does not prevent a person from driving a car on a major road at rush hour to buy a cup of coffee. That option still exists. But many citizens will voluntarily decide that it would be better to walk, bike, or bus to get that cup of coffee. Or travel on a side road to get it. Or drive at a non-rush hour time to buy the coffee. Continue to the next part of this section. http://en.wikipedia.org/wiki/Economies_of_agglomeration. See also: Community Design and the Culture of Cities: The Crossroad and the Wall, by Eduardo E. Lozano. And: Making America: The Society & Culture of the United States, edited by Luther S. Luedtke. And: Cities as Sustainable Ecosystems: Principles and Practices, by Peter Newman, Isabella Jennings. Agglomeration economies are the benefits that a town center or a business experiences when development is compactly located close together – or when a business is locating near supportive or beneficially related businesses (‘agglomerating’). When businesses or community functions cluster together, their costs go down and ideas or innovations or creativity synergistically increase. Cities form, and become more healthy and vibrant, when they take advantage of economies of agglomeration. See: http://en.wikipedia.org/wiki/Economies_of_agglomeration. Carlino, Gerald, Satyajit, Chatterjee, and Robert Hunt. Working Paper NO. 06-14. Urbn Density and the Rate of Invention. Federal Reserve Bank of Philadelphia, August 2006. Kundsen, Brian, Richard Florida, Gary Gates, and Kevin Stolarick. Urban Density, Creativity, and Innovation. May 2007. Such as air, water or noise pollution, the cost of protecting oil deposits overseas, etc. Assuming gasoline costs $4 per gallon. Walkscore.com uses a 5-minute walking distance for its measurements of walkability. The Walk Score algorithm awards points based on the distance to the closest amenity in each category. If the closest amenity in a category is within one-quarter mile (about a 5-minute walk), Walk Score assigns the maximum number of points. The number of points declines as the distance approaches one mile (about a 20- to 30-minute walk) – no points are awarded for amenities farther than 1 mile. Each category is weighted equally and the points range from 0–100. A score of 70 or more is considered very walkable. The number of nearby amenities is the leading predictor of whether people walk. Relevant amenities include businesses, parks, theaters, schools and other common destinations.